Looking to buy one of the best 3mm wetsuits out there? As you know if you've done any research, there are a ton of scuba diving wetsuits to choose from. To give you some guidance, we give you our pick of the best divesuits in the high end or top end category that should keep you warm for many dives to come. Of course, everyone is different and which of the top rated wetsuits is best for you depends on your budget and what you want in a suit. Here we present our picks for the top end category. Since we do not have the resources to use all these 3mm wetsuits ourselves, we went to the next best source - users. To make our list they had to have overwhelmingly positive reviews from users. We believe that if the vast majority of buyers give the wetsuit a high rating, chances are that it will work for you too. We spent many hours combing through websites and reviews to pick the ones we believe will be worth your hard earned money. The links will open in a new window to our partner's website. From there, you can read more of the detailed reviews and features and see if that wetsuit will fit your needs. Please let us know how you like your new 3mm wetsuit if you purchase one - we and your fellow divers would love to hear your experience. Note: This page has been updated as of December 2015 so it should cover you for the 2015 - 2016 winter diving season. We aim to update this page every 6-12 months to make sure we stay current with any new 3mm wetsuits coming out. We have a new winner for best 3mm wetsuits this year with this Bare model getting rave reviews from all users. It earned a stellar 4.8 out of 5.0. Can't get much better than that! This suit receives glowing reviews for its comfort and fit. To achieve that the company uses what they call progressive stretch where they put full stretch panels of varying degrees in specific areas to improve comfort and fit. In addition, they use different fabrics in various panels for an even more comfortable fit. Reading what people have to say about it, it appears to be working. Of course this suit has flat seams for extra strength and uses seamless underarm construction. It also features back and ankle zippers, an adjustable collar and rolled wrist and ankle seals. All in all, this new entrant is a winner and appears to be poised to stay at the top for some time to come. Our second pick for 3mm wetsuits was knocked out of first place this year but it is still a solid choice. Our second pick goes to a Henderson model. I guess it is not that much of a surprise since Henderson is such a big player in this field. This suit is made from Thermoprene which is a neoprene but it has 75% more stretch than your average wetsuit material. This makes it much more comfortable to wear than those suits that have little to no stretch. An you know how much fun those wetsuits are to put on. This material appears to deliver as the vast majority of reviews stated how comfortable this suit was. The seams on this suit are glued and blind-stitched making for a higher quality suit. This suit has a back zipper and an adjustable collar. 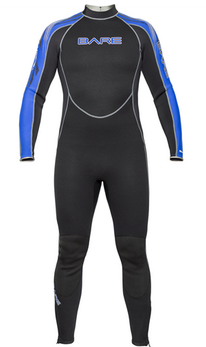 All in all, this is a nice solid suit which should help you stay comfortable during your dive. Check out this Henderson suit here. 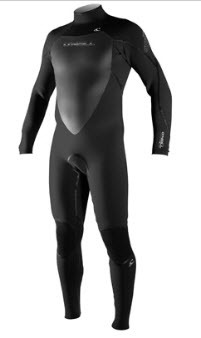 Our next pick is a Waterproof wetsuit. I have cheated a little bit here as this is actually a 3.5mm wetsuit and not a 3mil. I thought it was close enough that it shouldn't make a huge difference. This is a nice higher end suit with lots of good features. This suit is actually gender specific for a better fit (you can see the women's model here - although it is not as highly rated as the men's model. Go figure). Another feature of this suit is that the arms and legs are pre-bent so it is easier to move your limbs. Seams on this suit are double stitched. The Waterproof model also has zippers at the neck, wrist and ankles for an easier and more comfortable fit. The main zipper is down the back but there is a ahort front neck zipper to give you some freedom, especially when waiting on the surface. I think that is a great touch and very functional. There is an extra seal at these points to keep the water at bay. The company has also put some rubber cutouts on the shoulders and around the wrist which give traction and help your BC and dive watch stay in place. I can see that being useful feature. Our last pick of the best 3mm wetsuits is from yet another manufacturer - O'Neill. This pick is a full wetsuit and it is actually a 3/2 rather than a straight 3mm. If you are not familiar with this term, a 3/2 wetsuit means it is made of 2 different densities of neoprene - 3mm and 2mm. The 3mm, thicker portion usually covers the body and legs and the 2mm portion usually covers the arms and sometimes the crotch area. This configuration allows the body to retain heat from the core area and yet give some more flexibility in other areas. It is a popular style with surfers as well as divers. Seams on this suit are glued and blindstitched which is what you are looking for in a high quality wetsuit (see the link above to our free guide for a more detailed explanation). This suit made from a stretchy neoprene (technically the Ultraflex DS Neoprene) so it is easier to get on and off and offers more comfort underwater. It is said to have about 30% more stretch than typical neoprene. This suit was also made with less seams so it increases flexibility. A quirky little feature on this suit is an external key pocket located along the lower leg inseam. It also features and "exclusive urethane coated webbing taht reduces water entry." Read all about the O'Neill model here. We hope these picks for best 3mm wetsuits will help make your shopping a little easier. Please let us know how you like your new suit (whatever it may be) - we would all love to hear your experience. Have a good and warm dive!